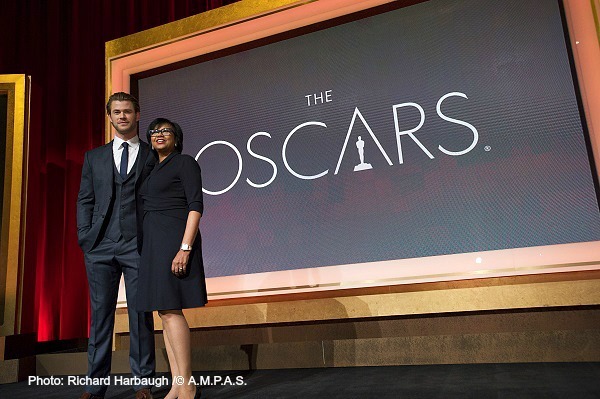 In the early morning of Thursday, January 16, 2013, Thor (Chris Hemsworth) himself along with the new Academy President, Cheryl Boone Isaacs, made the announcements of which films, actors, and movie-makers would be recognized for the highest movie honor with the hopes of possibly having the fortune of taking one of those golden statuettes home with them on Oscar night – March 2, 2014. The best news has been that The Academy has pushed back the date of the Oscars ceremony to March which was the awards show’s traditional month from years long ago, in contrast to more recent years when the awards occurred in February. Every year, The Academy nominations bring some unexpected twists, along with the expected ones. This year was no different. Some movies that should have been nominated were not, and some that were expected to be nominated were. Movies that were missed: Lee Daniels The Butler, Inside Llewyn Davis, Saving Mr. Banks. Some surprise nominations included: Jackass Presents: Bad Grandpa, Blue Jasmine, Before Midnight, The Wolf of Wall Street,and The Hustle. Some actor exclusions include: Tom Hanks, Oprah Winfrey, Joaquin Phoenix, Robert Redford, Forest Whitaker. 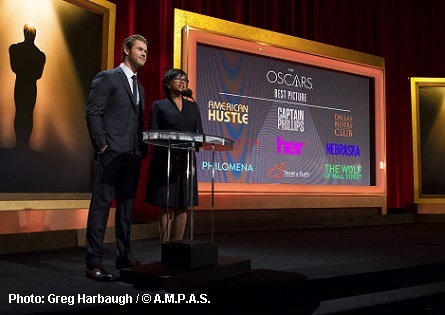 In the category for Best Picture, the nominees are: American Hustle, Nebraska, Captain Phillips, Philomena, Dallas Buyers Club, 12 Years a Slave, Gravity, The Wolf of Wall Street,and Her. Nomiees for Best Actor in a Leading Role are: Christian Bale (American Hustle), Chiwetel Ejiofor (12 Years a Slave), Bruce Dern (Nebraska), Matthew McConaughy (Dallas Buyers Club), and Leonardo DiCaprio (The Wolf of Wall Street). 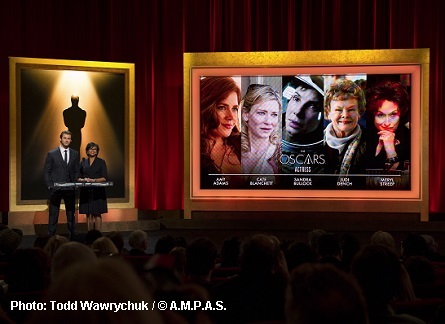 For Best Actress in a Leading Role, the nominees are: Amy Adams (American Hustle), Judi Dench (Philomenia), Cate Blanchett (Blue Jasmine), Meryl Streep (August: Osage County), and Sandra Bullock (Gravity). 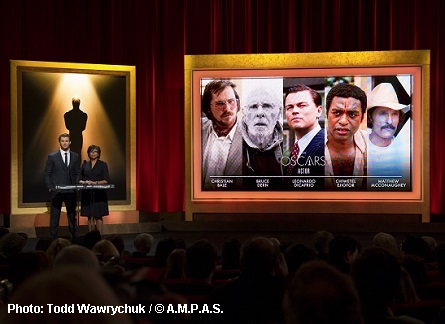 The nominees for Best Actor in a Supporting Role are: Barkhad Abdi (Captain Phillips), Jonah Hill (The Wolf of Wall Street), Bradley Cooper (American Hustle), Jared Leto (Dallas Buyers Club), and Michael Fassbender (12 Years a Slave). The nominees for Best Actress in a Supporting Role are: Sally Hawkins (Blue Jasmine), Julia Roberts (August: Osage County), Jennifer Lawrence (American Hustle), June Squibb (Nebraska), Lupita Nyong’o (12 Years a Slave). 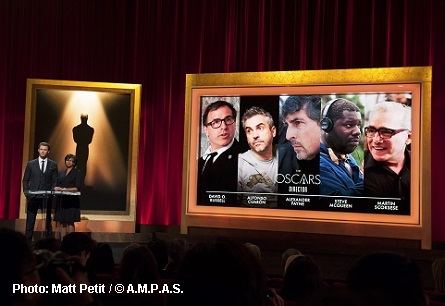 Nominees in the Best Director category are: David O. Russell (American Hustle), Alfonso Cuaron (Gravity), Alexander Payne (Nebraska), Steve McQueen (12 Years a Slave), Martin Scorsese (The Wolf of Wall Street). Official screenings of all motion pictures with one or more nominations will begin for members on Saturday, January 25, at the Academy’s Samuel Goldwyn Theater. Screenings also will be held at the Academy’s Linwood Dunn Theater in Hollywood and in London, New York and the San Francisco Bay Area. Active members of the Academy are eligible to vote for the winners in all categories.